BYU’s Charles Redd Center for Western Studies and the Sons of Utah Pioneers joined the Major Howard Egan Family Foundation in co-sponsoring the 200th Jubilee Celebration of the birth of Major Howard Egan. 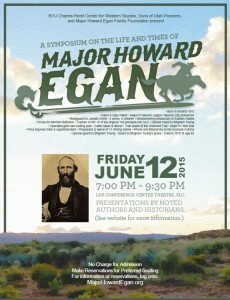 This three-day event, held on June 11th, 12th and 13th of 2015, consisted of an an historic Pony Express Day, an informative Egan Education Day and a fun Egan Reunion Day. To experience a little of what Howard experienced, some 90 descendants traveled in car-caravans along the Pony Express Trail from 9:00am to 7:00pm, with historians giving presentations at Pony Express stations along the way. After an orientation the group followed Highway 73 and made their first stop at Camp Floyd, site of the Fairfield Station, built by Johnston’s Army of some 2,000+ soldiers at the end of the Utah War. The full day trek ended at Egan’s Station at Deep Creek, in today’s Utah town of Ibapah. Deep Creek was Howard Egan’s home, and the most westerly Pony Express station within the present boundaries of Utah. Click–HERE for pictures of the event, a map of the Pony Express Trail, and a detailed Trail Guide should you want to take the trip on your own or with family and friends. Friday morning provided descendants with another Egan experience – a 3 hour, 4.5 mile hike on the Mormon Trail – the authentic Pioneer Trail that Howard Egan traveled at least 7 times. It was used by the 1847 pioneers, Pony Express, and stage coach lines. It was a pleasant mountain hike that traveled through beautiful narrow canyons, trees, streams, and beaver ponds. Click–HERE for pictures of the event, along with historical notes about the MormonTrail prepared by historian William G. Hartley, and Mormon Trail quotes and diary accounts by the early pioneers who traveled the trail by wagon and on foot. Friday afternoon descendants took self-guided group tours of Egan-related sites in Salt Lake City. Plaques were posted on each site with appropriate Egan history about each location. The Salt Lake Egan sites included: the location where Howard Egan and the 1847 Pioneers camped; the location of the Pony Express office; the location of Howard and Tamson’s principal home; the Lion House which Howard helped guard, and in which he nursed Brigham Young; Brigham Young’s grave that Howard helped guard; the graves of Howard Egan and other Egan family members; and the Daughters of the Utah Pioneers Museum, exhibiting personal belongings of Major Howard Egan, his family, and the era. Click–HERE for pictures of the event, along with a map of Egan’s Salt Lake City sites, and detailed explanations of each location should you want to take the tour on your own or with family and friends. In conjunction with the Howard Egan Symposium we also prepared a formal Exhibit of Egan Artifacts, with different collections: One Artifact Exhibit featured Howard and his life experiences. It contained various letters between Howard and Tamson, and two tickets he received to the dedication of the Salt Lake Temple, among other Egan documents. Another artifact on display was a wooden traveling trunk into which Howard had carved his initials. The most valuable artifact, on guarded display, was the original of a payment voucher signed by Joseph Smith authorizing Howard’s pay as a Nauvoo city policeman. A second exhibit featured Howard’s military life. One of the prized artifacts lent for this military exhibit was Major Howard Egan’s Mormon Battalion sword. There was also an exhibit that featured Tamson, Howard’s first wife. Despite the hardships of pioneer life, Tamson had beautiful clothing for special occasions, the originals of which were on display, including fashionable hair extensions. There was also an exhibit featuring Howard’s role in the Pony Express. Lastly, there were photographs of Howard’s wives and children, and copies of correspondence between them. Click–HERE for pictures of the Egan Artifacts Exhibit. Friday evening nearly 450 Egan descendants attended one of our key events: the Howard Egan Symposium, held at SLC’s Viridian Events Center. Four terrific historians gave presentations about “The Life and Times of Major Howard Egan,” and amazing musicians played Irish and pioneer songs between speakers. Click–HERE for pictures of the Howard Egan Symposium event, along with excerpts and full presentations of each of the four speakers. 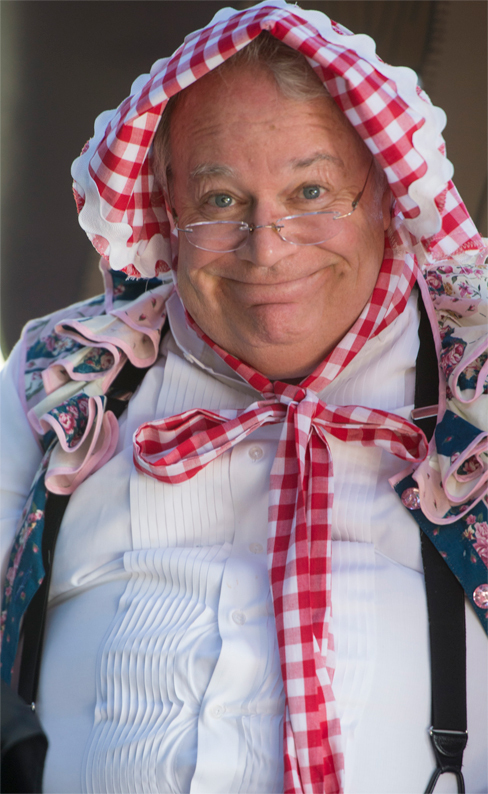 Howard Egan’s life experiences were highlighted throughout the This Is The Place Heritage Park. Festivities started off with Pony Express demonstrations and activities at the National Pony Express Monument, just outside the Heritage Park, followed by a short welcome, entertainment, and get acquainted activities. Thereafter families and new descendant friends entered the Heritage Park, followed an Egan-map, explored 14 Egan-related sites, and participated in Egan-related activities. During the event we also sold newly reprinted copies of “Pioneering the West,” containing Major Howard Egan’s journals, and took orders for the new “Biography of Major Howard Egan” written by historian William G. Hartley. Click–HERE for pictures of the Egan Family Day event. At 6:00pm the This Is The Place Heritage Park closed to the public, and the Egan Family party began. It included a catered Dinner; fun Mixers to help descendants get to know each other; Egan Activities, including Irish dancing lessons; and a great Program: the Egan Variety show. Click–HERE for pictures of the Descendant Family Party. The Gold Rush Trading Post period featured the song “Buffalo Gals.” The Cattleman & Trail Blazer period was commemorated with a sing-along Cowboy Song: “Oh Susanna.” And to celebrate Howard’s Pony Express period, “Pony Express Poetry,” written by David Rhodes was read by his brother, Jack Rhodes. This was followed by Miner Songs, Indian stories, and children singing Missionary songs. The final number was a newly written, sing-along Egan Anthem, written by Elayne Allebest. Click–HERE for pictures of the Egan Variety Show.